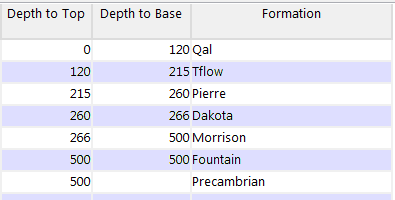 There are several ways to note missing stratigraphic formation data in the Borehole Manager Stratigraphy table. The method you use will affect, at its most basic, how 2D strip logs and log sections are displayed. It will also affect how stratigraphic surface maps, thickness maps, profiles, fence diagrams, and 3D models are created. One method of noting a missing formation is to list the unit in proper sequence in the hole, and assign the formation top and base the same depth, resulting in a thickness of zero (e.g. pinched out). This formation would not appear in individual strip logs. It would be displayed in log cross sections with stratigraphic correlation panels (StripLogs | 2-Dimensional | Section) as pinched out at the well. The formation’s depths for that borehole would be included in computations that generate surfaces and thickness calculations. Note how in this stratigraphic model, the red surface is pulled up to lie on top of the lower surface. Tip: Use the Stratigraphy | Fill In Missing Stratigraphy menu option for an automatic way of entering zero-thickness formations. Another way to note "no data" is to omit the formation name altogether. In this example, the Fountain formation is not listed at all. This tells the program that that formation is missing, and it should not be represented in individual strip logs. It would be displayed in hole to hole stratigraphic sections as pinched out at the well with no fill, or pinched out between wells. There is an "Allow Pinchouts" option in the hole to hole section window that offers the choice. The omitted formation would not be included for that borehole in computations that generate surfaces and thickness calculations. Note how the red surface in the example on the left is not pulled up to lie on top of the lower surface since there is no data for the borehole. Its "interference" with the lower formation is noted with the splotchy lines. On the right, this interference is avoided by activating the "onlap" option in the stratigraphic model settings. Onlap tells the program to build the model from the bottom up and give lower units priority over upper ones. Tip: Use the Stratigraphy Rules - Insert Missing Units for an automatic method of inserting zero-thickness units in proper sequence during processing. RockWorks won't actually add any data to your database, but will make these inferences in the background using your existing data, prior to diagram creation. The formation either will or will not be included in hole to hole stratigraphy section and fence panels for those borings in which its base is absent (as in "omitted formations," above), depending on how you've set up the diagram. The formation may or may not be included in stratigraphic models/profiles/fences – it depends on how many borings include the base (for most gridding methods, a minimum of 3 points are required to create a surface). If there are inadequate control points to create a base surface (or a base surface that you like), you can request the generation of a "baseplate" in stratigraphic profiles, fence diagrams, and models. This simply sets an elevation for the base of the model. Tip: Use the Stratigraphy Rules - Infer Partial Units for an automatic method of inserting unit tops or bases during processing. RockWorks won't actually add any data to your database, but will make these inferences in the background using your existing data, prior to diagram creation. If you are entering/importing stratigraphic data that contains tops only, or a mix of tops and bases with a lot of missing data, you can make this work also. Striplogs will now plot stratigraphic data when only the tops are defined. Use the Stratigraphy Rules - Infer Partial Units options to automatically set the lower depths to the top-depths for the next lowest unit. The depth to the base of the lowest entry is assumed to be equal to the TD (total depth) for the borehole.